Simon & Schuster, 9780743270526, 208pp. From the bestselling author of A Girl Becomes a Comma Like That, a moving, disturbing, and utterly original collection of stories that examine a universe where memory and fact collide, and the imagination fills in the gaps left behind. 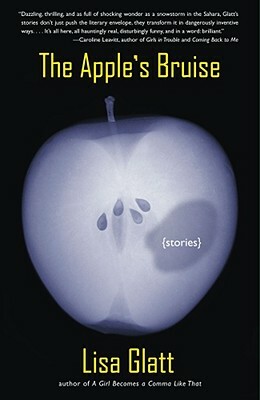 The stories in The Apple's Bruise take a smart and unflinching look at love, frailty, and happiness and prove beyond doubt that Glatt is a modern master at blending heartbreak and hilarity. In "Dirty Hannah Gets Hit by a Car," a seven-year-old girl bullied by a neighbor across the street gains strength after a serious accident; in "Animals," a zoo veterinarian from a family of butchers tries at once to deal with his marital problems and the high rate at which his animals are dying; and in "Soup," a young widow tries to reconcile her feelings for her teenage son's friend, the town delinquent. With tenderness, insight, and humor, Glatt casts her gaze simultaneously on the beauty and the absurdity of our humanity, creating unforgettable portrayals of unusual characters and the complexities of desire and fidelity that compel them. Lisa Glatt was the winner of the 2002 Mississippi Review Prize for fiction. Her work has appeared in various publications, including Columbia, Other Voices, Indiana Review, and Swink. She lives in Long Beach, California, with her husband, the poet David Hernandez. Visit her website at www.lisaglatt.com. "Dazzling, thrilling, and as full of shocking wonder as a snowstorm in the Sahara, Glatt's stories don't just push the literary envelope, they transform it in dangerously inventive ways....It's all here, all hauntingly real, disturbingly funny, and in a word: brilliant."